What can you eat at Easter? Chocolate eggs – and so much more! Spring flower sweets, marzipan bunnies, sunshine toast or daisy biscuits. Yummy gifts or tasty treats for yourself! 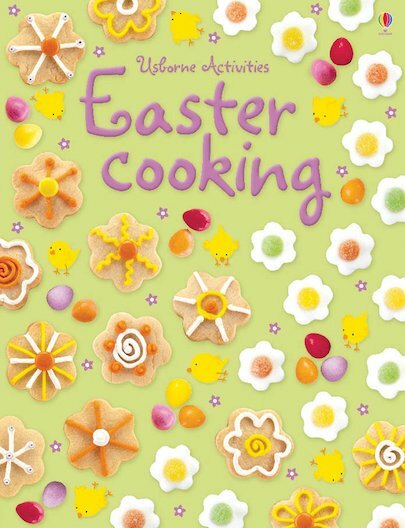 Full of delicious cooking ideas that celebrate Easter and the spring season, this book comes with tempting pictures and easy step-by-step instructions that are perfect for brand new chefs! If you want to share your treats with someone special, you’ll find ideas for home-made gift wrap and present tags too. So what will it be…? Fruit bread? Chirpy Easter fudge? Chocolate nests? Cheesy chicks? Grab your apron and decide! Lots of really nice things to make over Christmas and to give as gifts, i think some mums would love this too.